Spring has come early to Middle Georgia, and there is no better way to celebrate spring than a visit to Ft. Valley’s Massee Lane Gardens. The camellias are in full bloom, and over the coming weeks, the rest of nature will blossom along with them. Massee Lane Gardens is open Tuesday through Saturday, from 10:00 a.m. to 4:30 p.m., and on Sunday from 1:00 p.m. until 4:30 p.m. Admission for adults is $5, but senior citizens (age 55+) pay $4, and children under age 12 are free. 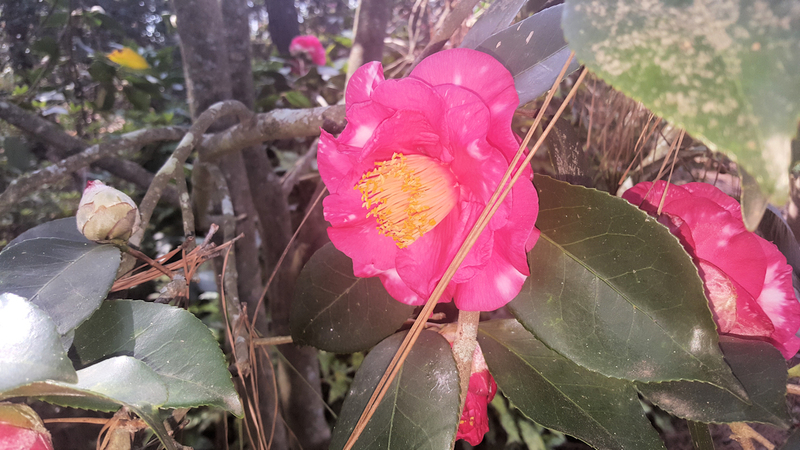 A variety of plants, including live camellias, are available for sale at the gardens. As the headquarters of the American Camellia Society, and a part of Georgia’s Camellia Trail, Massee Lane Gardens features six distinct gardens: the camellia garden, the Avera-Peterson Children’s Garden, the daylily garden, the Japanese garden, the rose garden, and the environmental garden. Ask at the front desk about the children’s scavenger hunt, but remind your little ones not to pick petals or leaves off of living plants. There are plenty of fallen blooms, leaves, and blades of cut grass to complete the scavenger hunt without plucking from the flowers. The brick-laid paths of the camellia garden have old-world charm that is perfect for a romantic stroll, a family weekend outing, or a photography session. There are over 1,000 varieties of camellia growing throughout the garden. Wandering through the camellias leads to a lovely hidden koi pond in the Japanese garden, with a peaceful bower where you can sit and enjoy the birdsongs, or step from stone to stone across the pond and look at the koi. In the Avera-Peterson Children’s Garden of Discovery, parents can sit in a central area while youngster’s explore a variety of smaller gardens. In the dinosaur garden, children can dig for fossils in the sand banked by plants from the dinosaur era. There is also a garden where children can smell different flowers and herbs, and a seasonal vegetable garden. Around Massee Lane Gardens, there are several ponds, and the children’s garden has its own small pond for children to enjoy. There is a butterfly garden, a gazebo, a playset, and even a flower maze for children to enjoy. Near the children’s garden is the environmental garden, which is distinguished by the screened-in outdoor classroom at its entrance, which is used for environmental education, and its viewing patio overlooking the garden’s 2.4 acre pond. There is a paved path around the pond that is perfect for families with strollers and others needing wheeled access. There are benches for wildlife viewing, and shady areas make the area pleasant year-round. Bluebird houses dot the shoreline of the pond, and a variety of native species grow along the path. The daylily garden comes alive in mid-spring, and colorful blossoms can be seen from May through the summer season. Year-round, there are delightful characters from Alice in Wonderland scattered among the daylilies to engage young visitors. Crepe myrtle blooms in late spring, and bird houses attract feathered friends to entertain young and old alike. The rose garden is a popular spot for engagement and wedding photographs, with its 150 varieties of drought-resistant roses and its beautiful gazebo. The rose garden has a climbing arbor where hydrangeas bloom. Its full charm can be enjoyed in the late spring. Massee Lane Gardens is home to America’s largest collection of porcelain by American artist E.M. Boehm, an American sculptor whose works featured many nature themes. His works may be viewed in two galleries onsite, the Stevens-Taylor Gallery and the Annabelle Lundy Fetterman Educational Museum. For every age, there is something to explore and enjoy at Massee Lane Gardens, and this is the perfect time of year to venture out and discover all they have to offer. Massee Lane Gardens is located at 100 Massee Lane Road in Ft. Valley, Georgia. 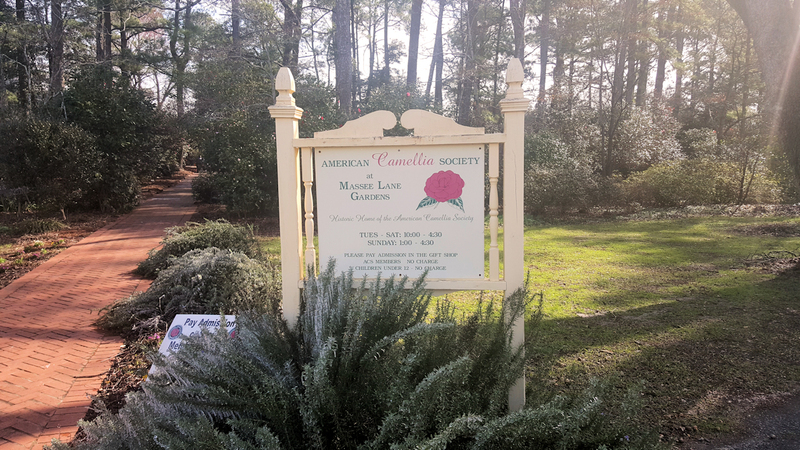 Call them at (478)967-2358, visit their website at https://americancamellias.com/, and like their Facebook page.